Truth be told, 2 women and 1 man have been working hard to update my Plain and Fancy Girl website. 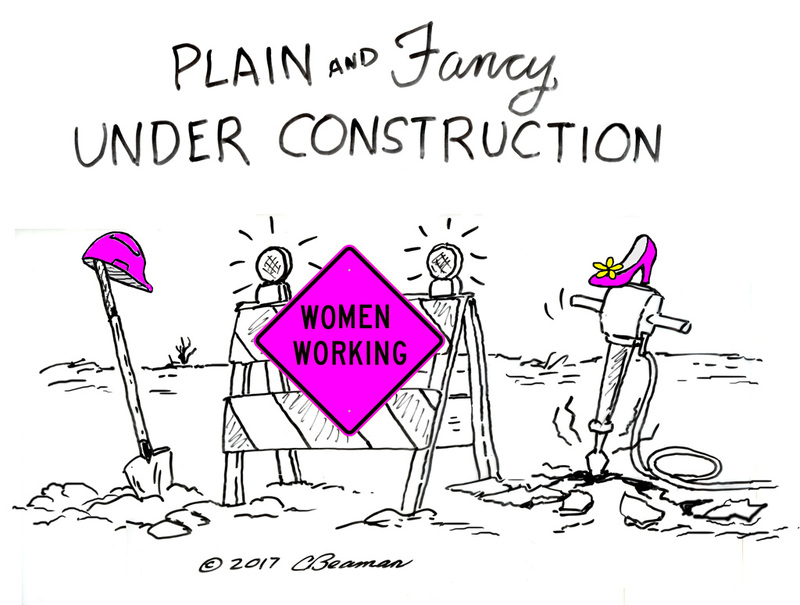 We will be wearing hard hats and steel-toed boots, not pumps, until February 1 when the new site will be unveiled. You were my first well wisher – and from South Africa too. I take that as a good omen. Thank you, Susan! Thanks for noticing so early this morning, Susan. You are # 1 today! I have no doubt it will be fabulous, Marian. All your hard work will pay off! You know well the connection between hard work and pay off. However, sometimes “the best laid schemes of mice and men gang aft agley”! A new website designed just for you! Can’t wait to see it. As one who appreciates artful trivets, I’m sure you can appreciate good design, which is what we are aiming for – now a work in progress. Thank you, Lynn. Oh, Lynn, you know the intricacies of trivets design. Web design is like that, filled with design and HOLES! I’ll be posting on the new site soon. I can’t wait to see it, Marian! Some of it is already poking through the cracks, Jill, as you can see. Launching new websites and books is not for sissies, as you probably are experiencing now marketing your new novel. Launches are never easy as you may be experiencing with your novel reveal “Second Chances.” All my best to you: I can only imagine – the travail and the triumph! Good morning and good luck with your new site, Marian. I see it is already different! Yes, Merril, it is different – and incomplete. Somehow the trigger got pulled prematurely. Time for a fresh start, like a new house for your daughter and husband. Love that story! Waiting with empathy. I know it will be wonderful! I remember Grandma L. saying, “Well, Marian, you have this thing on hind foremost,” a fancy way of saying “you’re wearing it backwards,” which pretty much describes the launch of my new website. Everything’s gonna be alright. I’m glad the red shoe stays–our first connection. Sending many deep breaths. How exciting. Can’t wait to see it. Will miss you til then. Much to do yet. You of all people know all about exciting beginnings, including the snafus and mis-communication that can occur. I hope your second restaurant site is working out well. Gloria. Can’t wait. It will be amazing!! During the upheaval of this transition, I will hold on to that word – amazing! Thanks for your confident statement today, Joan. It will be fabulous when it is finished!! Do you remember Patel in the Best Exotic Marigold Hotel? He said something like this: “Everything will be all right in the end. If it’s not all right, it’s not the end yet.” I’ll adopt this philosophy until all the kinks get smoothed out. That is just the best saying isn´t it. Hubby and I quote it quite often. I’ve wondered what’s going on… I’m a fan of yours, Marian, all the way! After a rocky start, it can only get better. The site migration would be so much harder without the support of faithful readers like you, Fatima. Thanks for your good wishes. Well, Cherry, I don’t know about the fresh paint. But there is sweat and tears – no blood yet: Ha! Thanks for checking in here, Marie. Changes are afoot as you can tell. Yes, it is exciting and a little scary too. Marian — Oh how FUN! I’m looking forward to the big reveal! It’s Tuesday, so it must be Laurie. As you can sense, I/we are still in the throes of re-birth here, and sometimes notifications from blogs I follow do not get through. This is a reminder to check your website today. I picture you somewhere in the ether, but firmly planted on your writing chair, clicking those keys. I must say I envy your solitude away from distraction. If there is ever a book # 2, I’m following your plan. Thanks for checking in here, very cheering!